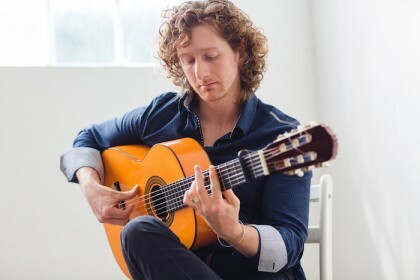 Gareth Owen is a world-class flamenco guitarist based in Victoria, B.C. He has collaborated with many internationally renown flamenco artists including guitarists Jesus Álvarez and Gaspar Rodriguez Roman, singers Coral de los Reyes and Miguel Rosendo, and dancers Domingo Ortega and María “Cha Cha” Bermudez. Gareth has recorded two solo albums, “Gareth Owen Flamenco Guitar” and “El Cobre”. He has also appeared on Alma de España’s CD, “Flamenco Live”. His third solo CD is currently in production and will be released later this year. He has performed solo concerts in Calgary, Victoria and Haida Gwaii, as well as tablao performances in cities across Canada and at the “Tablao El Laga” in Jerez de la Frontera, Spain. Gareth has had the honour of performing in the Toronto and Vancouver International Flamenco Festivals, Dawson City Music Festival, and Victoria Flamenco Festival. Theatre-scale flamenco productions have included “Café de Chinitas” in Vancouver, Alma de España’s “Recuerdos” and “Pasajes” in Victoria, “La Palabra en el Tiempo” in Vancouver and Victoria and Sonidos Gitanos’ “Convivencia” at El Portal Theatre in Los Angeles. Gareth enjoys collaborating with his wife, professional dancer, Denise Yeo, and fostering the flamenco community in Victoria, BC through the Alma de España Flamenco Dance Company and School.